About the Children's Department: Sneak Peek VBS 2015 - Camp Discovery from Concordia! Sneak Peek VBS 2015 - Camp Discovery from Concordia! Yes, believe it or not, today I'm sharing with you a sneak peek at VBS 2015 with Concordia's Camp Discovery! Take a look at all the amazing things your kids could learn and do next summer at Camp Discovery . 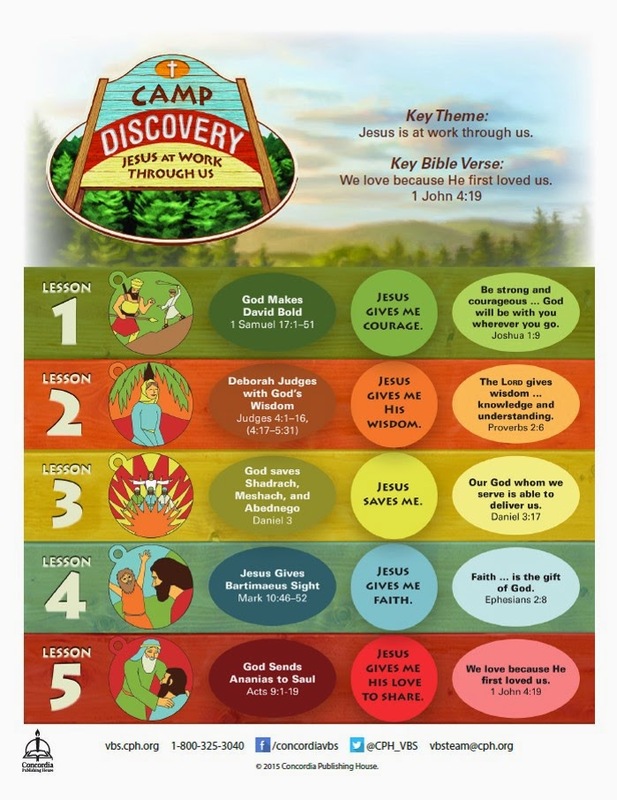 . .
Concordia says; "At Camp Discovery, kids have fun being kids as they explore the Bible, make new friends, sing songs and learn how Jesus works through them in their everyday lives. Our 2015 VBS takes kids on a high adventure to discover 5 Bible truths which excite and challenge them. Campers of all ages learn God gives them the wisdom and the courage to step out in faith as Jesus works through them—whether they’re at school, playing with friends, or helping out at home. Get excited for a camping adventure which makes a lasting impact on kids as they sing songs around the campfire, act out Bible stories, make crafts and eat tasty treats." I'm looking forward to seeing their new; "The Science Behind It" activities for Bible Challenge! Check back with About the Children's Department in January 2015 when I release my review of Camp Discovery!